ACTON: Frances G. Berlied (Shymonowicz) age 96, passed away peacefully surrounded by her family on November 7, 2018. Fran was born and grew up in Maynard and was a lifelong Acton resident for 71 years. She earned her nursing license at the Wellesley, MA nursing school and worked at the first location of Suburban Manor Nursing Home in the Victorian home on Central Street in Acton. 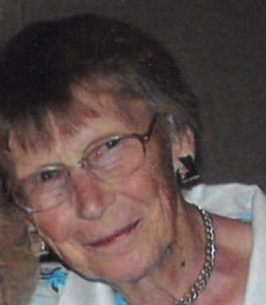 She later worked as a charge nurse and retired from Walden Nursing Home in Concord. She was always there to help her children with any needs that might arise and never turned down a chance to watch her grand kids, delighting in watching them play basketball, baseball and lacrosse where she would root loudly. She lived in the house her husband of 63 years, Irving, built for them and fulfilled her wish that she spend all her days there. Her home was a museum of memories that she cherished every day. Fran’s love of gardening kept her yard beautifully adorned and she loved chatting with anyone who might pass by. Her love of York Beach, Maine spurred her to buy a quaint cottage where she spent much of her time with her family and friends. Greeting all she met with a smile, she will be greatly missed but always remembered. She is survived by her son Chris and his wife Cindy of Acton, her daughter Judi and friend Donna Gaudette (who was like Fran’s second daughter) of NH; grandsons Kris of Mechanicsburg, PA, Rob of Springfield, MA, Michael of Reno, NV and Bryan of Acton. She was predeceased by her husband Irving Berlied and son Tad Berlied. Additional Information	In lieu of flowers, donations may be gratefully made to Minuteman Senior Services Meals on Wheels Program, 26 Crosby Drive, Bedford, MA 01730, also online at www.minutemansenior.org. We encourage you to share any memorable photos or stories about Frances G. (Shymonowicz). All tributes placed on and purchased through this memorial website will remain on in perpetuity for future generations. I just wanted to express my condolences to the family of Ms. Berlied. I'm sure she will be dearly missed. I find these scripture comforting, I hope you will too. Psalms 34:18 says, "Jehovah is close to the brokenhearted; he saves those who are crushed in spirit". God knows what we go through and he reassures us in the Bible that these things will not go on forever. Jw.org can explain if you're interested.